I was cycling down this fairly remote road the other day and passed this young girl, she looked all of 5 or 6 years old, walking down the road by herself on her way back from school. As I passed her she called out a big hello and seemed completely safe and happy with the world, unconcerned and unworried about who I might me. It reminded me of when I was young. 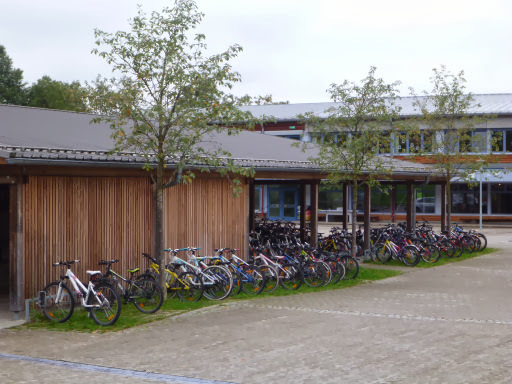 I just thought it was so brilliant to see that so many of the kids cycled to school (there's a whole lot more bikes just around the corner that you can't see in this photo). Sure there are so many things over here that make it possible ... shorter travel distances, smaller towns, flatter roads, more bicycling paths, helmet laws (lack thereof) but still ... wouldn't it be great if Tasmanian kids rode to school like these kids do? And while I acknowledge that I have no right to comment on this as I'm not a parent, it just made me think ... Have we overdone the stranger danger thing? Have we scared ourselves so much that we're depriving our kids the freedoms we enjoyed? I think about my sister who many years ago wouldn't let her kids ride or walk to school due to concerns over 'the dangers', and then seeing kids over here, I have to wonder are we creating our own fears? But then I also remember that look of horror on Kim's face that time I 'lost' Zara down at cockle creek, and I do know that the downside risk of trusting society is that sometimes, and it may only be once in a million times, the price is terribly, terribly high. Though in Kim's case she did find Zara again (damn it). There's no wrong or right answer of course, it's just something to muse over as the kilometres tick by.